Politics came crashing into our lives last year when our son, William, stood in the council elections. Suddenly, we were Liberals: putting leaflets through doors, going to the count in the local sports hall. He was the youngest candidate standing anywhere so he had quite a lot of press attention. I remember getting him up at 6am to do a radio interview (on the phone, in his dressing gown, sitting on the sofa). Even as parents it was quite an intense experience. He came a good second and, after saying ‘Well done’ to him, I went to congratulate the winning candidate. ‘Oh thank you, Monica,’ she said and gave me a big hug. Well Reigate is a bit like that. When this book was published it caused a mild media flurry. 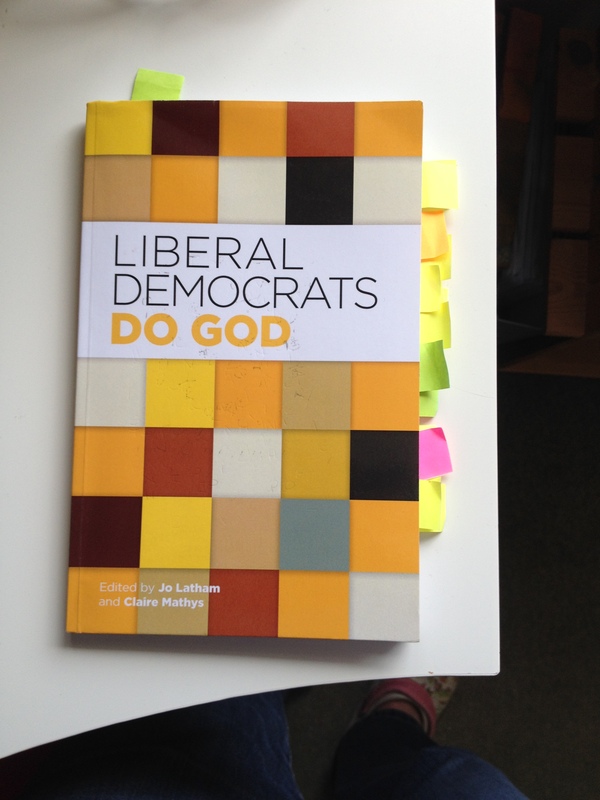 The title is based on the famous comment from Alistair Campbell following an interview with Tony Blair that ‘We don’t do God’. It is encouraging that many politicians (including our current Prime Minister) are prepared now to publically declare their faith and the effect it has on their life. My feeling is that the attempt (by the ‘New Atheists’ and others) in the late 20th century to ‘Kill off God’ may have had quite the opposite effect. It has encouraged people from all walks of life to be honest about their faith in a way that has not been possible for some time. When the Earth shall be filled with the glory of God as the waters cover the sea. Let’s start by thanking God that we live in a secular and pluralist society. Within a few hundred years of Jesus’ death on earth attempts were being made to control and manage the Christian faith. This reached its peak in the late middle ages but, even by the year 1800, it was still impossible, in the UK, for anyone who did not belong to the Church of England to enter parliament, get a University degree or hold public office. Of course, you also had to be a man and of reasonable personal wealth to do most of these things. Even those following other flavours of Christianity such as Baptists or Catholics were excluded. As Sir Andrew says: ‘We have never been all one great big happy Christian family’. This level of control had some unexpected consequences. One of these was to force Jews and non-conformist Christians into other areas of public life, such as banking and manufacturing. But a less positive effect was to weaken the Church in this country, to the point where going to a church service was not seen as a act of faith at all, but merely ‘doing the right thing’. Stunell mentions a whole list of things that have improved in our society: Slavery, women’s rights, care for the disabled, relaxation of dress codes, but I would like to highlight another improvement in our society and in our churches that we now take for granted. A friend of mine was divorced about 40 years ago. Added to the pain of ending her unsuccessful marriage was a virtual exclusion from her normal society. The church she belonged to was unwelcoming and certainly offered no help. All her friendships and clubs depended on her being part of a couple. We have come a long way since then. Churches offer ‘Divorce and separation’ courses and actively welcome divorced people and remarried couples. People generally are more relaxed and accepting of divorce and its consequences. The failure of a marriage will always be painful and difficult but at least the people involved can now start again much more easily. In ten years time Christians will look back at the fuss we made about Gay marriage and wonder what it was all about. We will wonder how we could not have opened our church doors and our hearts to those who had struggled to find their place in society; who were, after all, our neighbours. We will wonder how we could have denied the love of God to so many people. Not just our gay neighbours but all the non-gay people who could not accept a church that seemed to pass judgement on people just because of who they were. In this generation it is rights for gay people that seem so hard to acknowledge and so readily denied. In contrast to that, in all my years as an MP and a councillor I have never once had a letter from any Christian asking me to make committing adultery a criminal offence, or to introduce a law to stop adulterers adopting children, or prevent them from teaching children or repeal the Civil Marriage Act that permits them to remarry, or to require them to have medical treatment to prevent a recurrence of their sexual behaviour. I have had all of those things recommended to me about gay people. That is despite the fact that adultery is unambiguously condemned in Scripture in a way that goes far beyond the somewhat iffy references dredged up about gay behaviour. It unambiguously causes far more harm to far more children than gay behaviour, and is unambiguously very much more damaging and destabilising to families, and of course the institution of marriage, and society at large. Just ask any MP about their Child Support caseload. My plea would be for more consistency and more transparency. Treat our fellow citizens as grown-ups, by acknowledging that we are now a multi-faith nation with strong intra-faith links at all levels of society. If that means disestablishment for those of us who live in England, so be it. If that means that King Charles III decides to call himself “Defender of the Faiths”, well why not? I understand that since the Swedish Church was disestablished in 2001 it has gone from strength to strength, with new commitment to its mission and increasing membership. I have no reason to believe that the English sky would fall in, any more then it did in Wales. I think we, as Christians, need to reclaim the debate on disestablishment of the Church of England . I was cooking macaroni cheese on Friday and pondering how to make the separation of the Church and State seem at all relevant when I heard a rather sad little story on the BBC News about bats. The journalist was talking to a Church warden from a church in Norfolk. More than 300 bats were roosting in his church. As they are protected he was unable to get rid of them. He described putting down sheets every night and coming in every morning to find them soaked in urine and dotted with poo. The stink was putting people off coming to church at all! What was not mentioned was that he was unable to just close down the church building and set up in a school hall (or other practical venue). Of course not, the parish church is the parish church. Above all, I hope to those of us who remain Anglicans can soon find a way to return to Christ’s own teaching and stop agonising over the dated views of my namesake Paul of Tarsus… Sorting out a speedy way to implement the clear majority view of the Church that the “Stained glass ceiling” of women priests is ludicrous, and offends all our Christian instincts would be an excellent first step in this direction. I am an Anglican. In many ways the Church of England is stronger than ever. Those who belong to this organisation are really committed to both the Church and to God. There are very few ‘Pew Fillers’ any more. And in Justin Welby we have a really remarkable leader. But, to fulfil our potential we need to break the shackles from the state and stand free. This entry was posted in Faith, Society and tagged Andrew Stunell, God, Liberal Democrats do God, Lord Tyler, Politics, St Martha's Church on June 17, 2014 by Monica's Books.